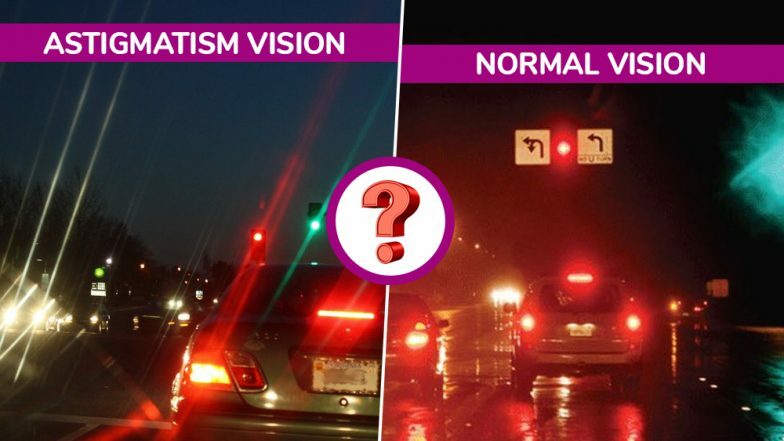 Astigmatism vs Normal Vision: Viral Image on Twitter Claims to Diagnose the Vision Condition, Here’s the TRUTH! Doctors usually advise to not believe any social media content for any kind of authentic information, diagnosis or remedy. However, every day some kind of post indicating or touting some medical information surges online and people go bamboozled. The most recent one that is going viral is an image claims to diagnose Astigmatism. Astigmatism is cornea related common vision condition that causes blurred vision and occurs when the cornea is not shaped right. This viral tweet is going around claiming to diagnose the difference in vision for someone with astigmatism and someone with a healthy vision. The Twitter handle goes by the name, @UnusualFacts, shows a comparison between two images and one of them is with glare from lights in a nighttime scene whereas the other is without the glare. Eye Care For Winters: Some Tips to Prevent Dry Eyes in The Cold Season. The tweet says: "Astigmatism is when the cornea is slightly curved rather than completely round..With astigmatism, light focuses on several points of the retina rather just one point. This is what people with Astigmatisms vs without. [sic.]" What Does Astigmatism do to Your Vision? One of the most common and major symptoms of astigmatism is when you have blurry vision. You suffer from astigmatism when the front surface of the eye or the lens inside the eye is curved differently, this may cause the vision become blurred at any distance and can also lead to eye discomfort and headaches. However, the blur described isn't very much like what is shown in the viral picture, in fact, its a kind of blur that you see in a portrait mode picture. Moreover, in some cases, you may see a double reflection of the object. Astigmatism can be from birth, or it may develop after an eye injury, surgery or disease and only a thorough eye exam can determine if you have astigmatism or not. Astigmatism usually shows gradual symptoms and you must rush to an authentic eye doctor if you notice changes in your vision.